Have you heard of Marble Jar? It’s a nifty little iPhone app that helps you break down difficult parts of your day into smaller tasks so you can get it done and maybe even reap a little reward. And since I now have an iPhone, I happily agreed to review it! Marble Jar is a way to get your family involved in taking control over the craziness of life. It really doesn’t matter what your age, everyone has areas that need improvement. For instance, we are working with Oscar to take a “no thank you bite” at meals. We don’t require him to eat things he doesn’t like, but we do want to encourage him to try new things. With each new food he tries, we can drop a marble into the jar and he can earn a privilege. What is exciting to me about Marble Jar is that the whole family can use it as individuals or as a team. If we have a family goal, we can create a jar for that. I tend to get behind on housework and Marble Jar is a great way to keep track of my daily tasks so I am not stuck trying to get everything cleaned up at the end of the day. I can set time deadlines and fill up the jar all day long. My phone is always with me (and I love a good checklist), so this app is right up my alley. The design is cute! I am drawn to it because it’s visually appealing. I am more apt to use programs that are fresh and fun! It’s customizable. 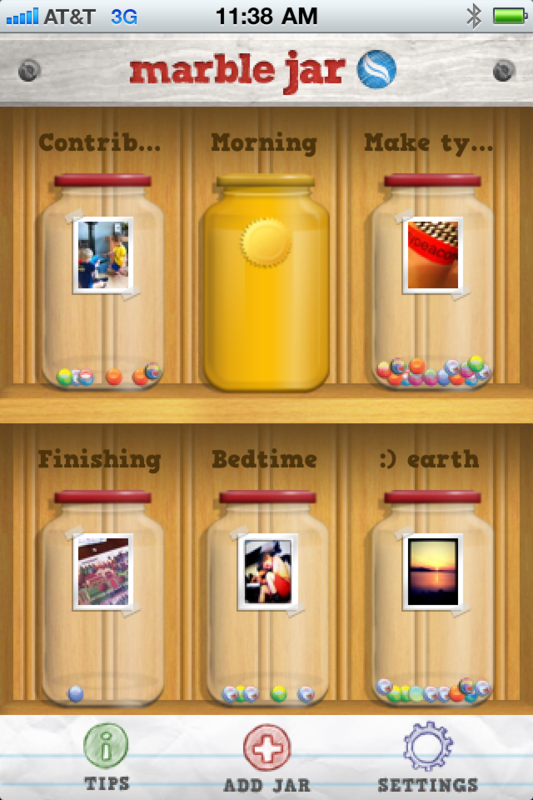 Each jar can be customized with tasks, rewards and even pictures that are specific to you and your goals. It promotes accountability. Having a routine makes all of our days run better. 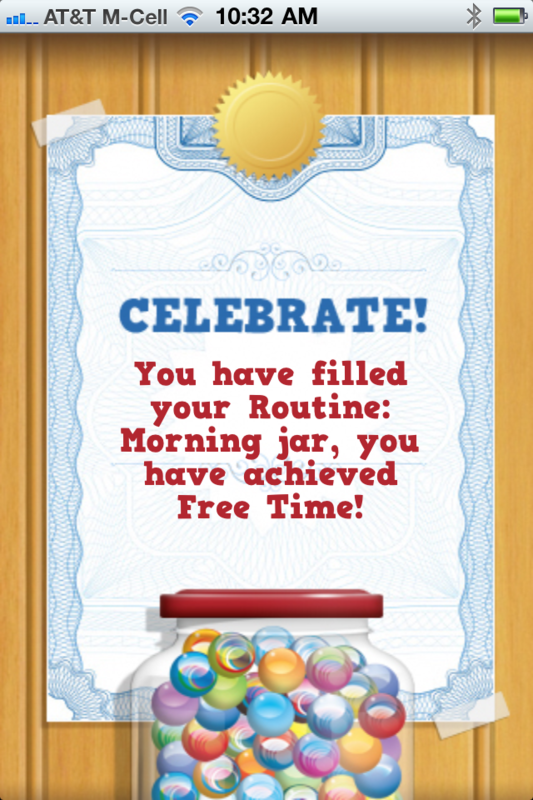 Marble Jar uses positive reinforcement to help us reach our goals and have fun along the way! Deciding to use an app like this requires the family to sit down and really evaluate what is and isn’t working about their daily routine. It promotes communication, goal setting and rewards for following through. My main complaint is that I had some technical difficulties when I first tried to log in and get started. I also had an issue attaching a picture to one of the jars, but after doing a little digging on their website, I found that a new version is about to come out which will hopefully resolve these issues. Overall, you only get back what you put in with Marble Jar. My biggest hurdle is remembering to drop the Marbles in the jar. But after a while, that little jingle when the marble hits the “glass” becomes a reward in itself. It’s satisfying to feel like even the smallest action matters. And of course coming up with rewards never gets old! You can download Marble Jar in the iTunes app store! Have you used Marble Jar yet? I’d love to hear your thoughts! Disclosure: I was compensated for my time to review this app. All opinions are my own. I love that you said this: “It really doesn’t matter what your age, everyone has areas that need improvement.” It’s so true even if we don’t always want to admit it! I can think of so many uses for Marble Jar for all members of our family- adults too! Thanks for sharing this! 3. Be able to send people marbles via Facebook, email, and text to thank them for something that helped you/made your life better?